The HEART Of Your Waste Water Recovery System! The most important part of any reclaim system is the vacuum. You need a serious vacuum to do the job right. A vacuum's true power rating is based on airflow and suction, not on amperage or horsepower. Don�t be fooled by horsepower ratings, which are often ratings of "effective horsepower" instead of true horsepower anyway. 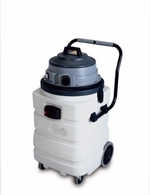 A vacuum designed for the removal of dry soils has a very high airflow rating and a relatively low suction rating. A vacuum specifically designed to carry away liquids has a relatively lower airflow rating and a much high suction rating. To better understand the difference between airflow and suction, let�s begin by describing airflow. Airflow relates to air volume. The airflow of vacuums is measured in 'cubic feet per minute' or CFM. A high-efficiency vacuum designed for dry soil removal on carpets for example, might move 156 CFM whereas a high efficiency vacuum designed for the removal of liquids might only have the ability to move half that amount of CFM. Suction, on the other hand, is often measured in 'inches of waterlift' - how high a vacuum motor can lift a column of water one inch in diameter within a tube. No airflow - just suction. We refer to this measurement simply as �lift�. This is the real measurement of power in any vacuum, because it doesn't take much power to move air but it takes a whole lot of power to lift water. A high efficiency vacuum for dry soil removal on carpet, for example, might have a lift of only 12", whereas a high efficiency vacuum designed for removal of liquids might have a lift rating of 150". For illustration, most wet/dry shop-vacs only have 12" - 18" of lift - just enough to get the water into the canister if it is sitting on the floor. Since we are lifting water with our capture system, the lift rating is the most important information to understand when researching which vacuum to buy. If we are lifting water from the street to the tank in our truck, we probably need at least 4'- 7' of lift to get the water up there without burning out the vacuum motor (the distance from the street to the top of our recovery tank). The more lift we have, the easier it is for the vacuum to do the job - and the longer it will last in heavy use. We recommend you look for at least 100 CFMs and at least 100� of lift in any good vacuum system you select. If you are using a VacuBoom and a vacuum surface cleaner at the same time, which is a pretty common set-up, we recommend buying a 200 CFM vacuum (either gasoline or electric) with 150� of lift. With that kind of brute power, you get the job done in a hurry! A good-quality vacuum with all the lift that you need and want can be a significant investment. Over a couple of years, however, buying a commercial-grade quality vacuum system will turn out to be cheaper than all of the $100 vacuums you will buy in it's place. Be smart when you shop, and look for the �Snap-On Tool� level of quality. NOTE: Most Sirocco equipment is made to order because of the wide variation in options available. This can add several days to your ship time.